Home|Floral Library|Shell Ginger – Alpinia spp. Shell Ginger – Alpinia spp. Decorative Life: 7-21 days or more. Should be harvested when the inflorescence is about two-thirds open or more. Namely, delay harvesting stems as long as possible as increased stem length means longer vaselife. Hot water dips are used to control insects just prior to shipment. The best procedure is to dip them for 15 minutes at 104F followed within one hour with at 12-15 minute dip at 122F. This dip sequence actually increases subsequent vaselife by about 130%. See Chantrachit and Paull (1998) for more details. However, other researchers (Hara et al., 1996) state that a 2 hour hot air (102F) conditioning treatment prior to a 12-15 minute 120F hot water dip is better since damages that can be caused by the hot water dip alone can be avoided. Chill sensitive, store above 55 F, up to 65 degrees F. Also, store upright to prevent bending (geotropic) problems. A great number of gingers have been introduced into Hawaii, mostly from Indo-Malaysia. 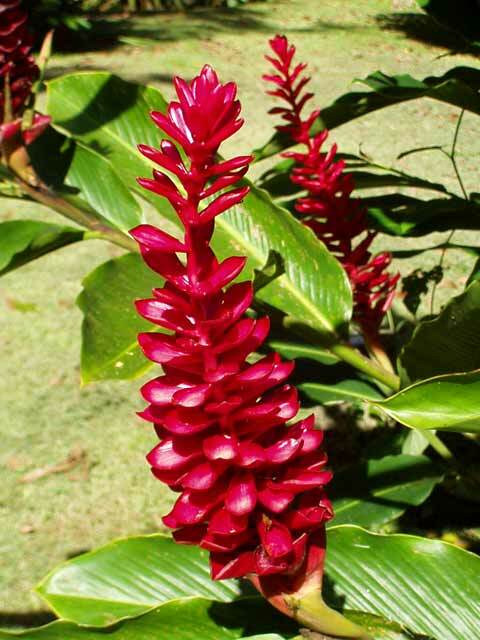 The red ginger is a native of Polynesia and is the most popular export variety. Edible ginger root, tumeric, and cardamom are some of the approximately 1350 species in the Zingiberaceae. Instead of a regular root system, gingers like heliconias spread and propagate by fat, knobby, ground level stems called rhizomes. Named after Prosper Alpino who was an Italian botanist, 1553-1616. Leonhardt (2004) showed that a 12 minute dip into 120F water increased vaselife from 26 days for the no dipped controls to 41 days.